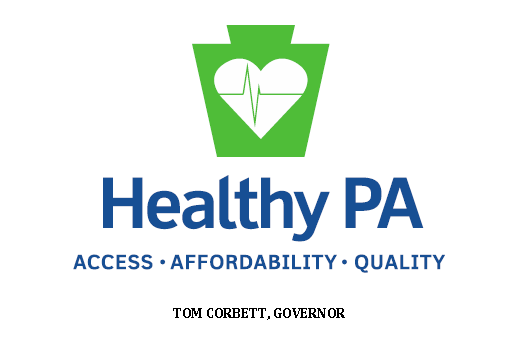 Healthy PA is Pennsylvania Governor Tom Corbett’s idea for unconventional optional Medicaid expansion that would require a waiver from the Federal Government. As part of the process the Department of Public Welfare held a series of hearings around the Commonwealth, soliciting public comment via strictly limited three minute turns at the microphone. Written comments were accepted at the same time or separately through January 13, 2014. This video is the Power Point presentation that preceded public comments at each meeting. I was able to get a total of nine minutes to comment by attending three of the eight hearings. At two of the hearings I spoke unscripted and at the Harrisburg hearing January 9, read a prepared script which I then left as a written submission. My intention was and is to publish some observations on the hearings. I took notes but made no recording, especially since the presenter’s comments were being transcribed either by manual input or voice recognition and appeared on a large screen facing the audience in real time. DPW says they intend to publish a summary of the comments with responses prior to the waiver request submission, but I wanted the verbatim account in the transcripts, both to read comments of others and publish my own unscripted remarks as they were presented. The extent or nature of the request precludes a response within the required time period. I simply cannot buy either of these excuses. How can they solicit public comment, which anyone had the right to record, obviously make a direct transcription of it, and then suggest it may not be part of the public record? Then too, why would it take longer than a week to give the records to anyone who properly requests them? Would the fact that they know me to be a detractor from Healthy PA have anything to do with their response? Also I wonder why any of this should be necessary. Yes, I did have a right to record the event but chose to not do it. That said, how much trouble would it be to require all public meetings to be voice recorded (if not video also) and posted within hours online so anyone unable to attend in person could listen? It seems that would be a very easy but very significant improvement to our Sunshine Act and Right to Know laws, greatly improving transparency, as well as saving costly clerical efforts in situations like this. Despite its good intentions Healthy PA is a misguided and dangerous additional step in the direction of fiscal insanity. First let’s think about the insidious lure of “Federal” money. Federal money IS our money. It comes from the pockets of Pennsylvanians or is imposed as a crushing debt on our children. While Healthy PA is not exactly an expansion of the existing failed structure, we know there are better approaches to the entire Medicaid program. We can see the results of situations where people are empowered with ownership of accounts they control. We know how spending one’s own money can control overuse, encourage wise use, and reduce fraud. Healthy Indiana showed how money can be saved by giving it away-such is the power of ownership! Knowing this we should insist that any expansion only be considered after first changing how we run the existing system, using savings wrung from it, except in this “partnership” arrangement the rules only go in one direction, from the Federal Government top down. We also know of suggestions to boost the number of and participation in free charity clinics, where doctors can operate outside the crush of burdensome regulations. We’ve passed Act 10, and HB1760 sits in our Health Committee and would not need a Medicaid waiver. While any state would put itself at an extreme financial disadvantage by exiting the Medicaid program entirely, we also know that if every state did so we would all be better off. The added layer of Federal bureaucracy and administrative expense could be used to treat needy sick people. Think then where we are today. Here we stand asking a powerful central authority to give us permission to do what should be the absolute right of free sovereign states and people under a constitution unique in the history of the world. This is America upside down. This is a great nation in decline. Healthy PA is further participation in that decline, and it’s time we stop allowing it to continue and expand. Rather than making a stand for commonsense solutions we do understand, by becoming leaders for freedom, educating our citizens to what really would work to the extent they understand and demand it, we succumb to expediency, dare I say, political expediency, in an election year. It’s time we act like the sovereigns we are and end this bowing to a powerful central authority in Washington DC that is changing the fabric and face of America. Thinking beyond ourselves to generations yet to come we would set Healthy PA aside and choose a different path. So much about Obamacare has been “by any means necessary”, from the legislative gymnastics to get the bill through Congress to the current mandatory expansion of Medicaid that is here now even though largely unnoticed. Here now? But wasn’t Medicaid expansion optional? Some yes and some no as it turns out. This almost unknown stealth expansion was required of the states and imposed on them despite the Supreme Court ruling because it is being funded 100% by the Federal Government, but only for two years 2013 and 2014, after which, funding abruptly ends. Because a strong constituency is being created (or bought) that will demand this expansion be continued past 2014, and no one can predict the outcome of those likely demands, further possible complications and risks arise for those states that decide to embrace the optional Medicaid expansion. Allow me to explain. Because of current constraints to participation by medical professionals both by low reimbursement rates, 1800+ pages of cumbersome rules, and audits that go beyond financial fraud to interfere in actual treatment decisions, there are at present not enough willing doctors to adequately serve those now eligible for Medicaid benefits. Realizing this, and attempting to avoid making the optional expansion to 133% of poverty and influx of new eligibles a disaster, “any means necessary” was once again deployed. On November 6, 2012 (surprisingly not a Friday) CMS published a Final Rule to go forward. 146 primary care Medicaid services identified by the ACA would, by regulatory proclamation, be compensated at the higher Medicare rate, starting with 2013 but only for two years. Since Medicaid reimbursement rates relative to Medicare reimbursements vary tremendously from state to state, the percentage increase covered by Federal funding varies accordingly. At one extreme are two states that surprisingly pay higher Medicaid fees for the covered services than they do for Medicare. These states will receive no additional Federal funding. At the other extreme is Rhode Island, where Medicaid fees will increase 198%. Five other states will receive boosts of over 100%. Pennsylvania is number seven on the list and doctors will be compensated an additional 96% to equal the higher Medicare rates. On average across the nation Medicaid fees for the ACA primary care services will rise 73% at an estimated cost of $11.9 billion, all in an attempt to keep willing physicians on board, expand their willingness, and attract newcomers. The problem, of course is what happens after 2014. It is unimaginable that doctors enjoying the higher reimbursements for two years will do anything but lobby stridently to extend the increases and indeed have them made permanent. Realizing, otherwise, the carrot to participation would no longer exist, this outcome can be considered probable. The mystery is who would then pay? Would the increase be included in the ultimate 10% state funding under optional expansion to 133% of poverty or even some formula that would require states to pay more? Would the increases fall to each individual state or be averaged over all the states? The point is that today no one knows. While perhaps not being the main reason to avoid the optional Medicaid expansion, especially those states with the greatest percentage “temporary” increases need to consider the possibility of very serious consequences in the aftermath of this two year attempt by the Federal government to buy a loyal constituency for implementation and avoidance of massive failure. It is also interesting that the current reimbursement increases were only applied for two years, as estimates for the cost of Obamacare have been made over a ten year period, allowing more, for now, to remain hidden from view. The two main sources used for this post were a policy brief from the Henry J. Kaiser Family Foundation and an article in American Medical News published by the American Medical Association. More details can be found at these two locations. Also used was a recent article written by the President of the Texas Medical Association. Note: This post was shared to WatchdogWire-Pennsylvania on Sep 24, 2013. Every State Not Expanding Medicaid (and those that do) Needs to Do THIS — ASAP! Pennsylvania is fortunate to have a governor who has made bold choices in opposition to Obamacare by both declining state insurance exchanges and the more difficult, but entirely correct, refusal to expand Medicaid, but it can’t stop there. Governor Corbett and all non-expansion states need to explain why their decision was correct and promote alternative solutions asap, or lose the battle for public perception as Democrats are painting the Governor and the GOP as standing against the poor and caring only about the rich, despite it not being true. Last week on PCN-TV, a Pennsylvania version of C-span, State Senator Vincent Hughs was practicing his art of indignation by trashing the Governor on Medicaid expansion and demanding to see the figures on Governor Corbett’s fiscal concerns. He also posted a response on his website. Senator Hughes seems to have the idea that adding more free stuff from others better off can never go wrong, and because we would in the end retain 90% Federal funding, that Federal money somehow materializes from thin air, rather than from the pockets of people in the states, including Pennsylvanians. For the benefit of Senator Hughes, and to his credit, we should look at numbers, and outcomes and realities as well, being sure to consider everything we know and leaving indignation, hubris, and emotion at the door. If Senator Hughes would approach the debate in such fashion and the GOP would learn to articulate their message and promote detailed solutions and alternatives to Medicaid expansion we may find places where we can agree, and even discover ways to provide better care for the poor at less cost to the taxpayer. These constraints to participation create rationing by waiting time, length of visits, and lack of availability to care that result in the much higher cost of seeing non-emergency cases at hospital emergency rooms. After all it’s better to wait 6 hours to see someone than 6 days or 6 weeks, and those facing such choices cannot be blamed for doing what they perceive is in their best interest. All this has numbers attached too that Senator Hughes and those deriding the Governor’s decision should be equally interested in seeing as well. Ask any doctor. Medicaid patients often fare worse than patients without any insurance. Expansion of eligibility will do nothing but increase the waiting times of those already attempting to find access from too few professionals who can afford to offer it. Coverage clearly does not equate to care. Also, expansion to 133% of poverty forces more people into Medicaid because only those over 133% will be eligible for subsidies in exchanges. Many additional people toward the upper end of the 133% will be be forced to drop private insurance they now have to join the ranks of the current overextended Medicaid mess. Senator Hughes and others, is this what YOU want? We must look to better ways to provide for our poor, not extend a system of failure. Various alternatives to providing for the poor have been tried, some with much success and satisfaction. Successful innovations have been tried in Indiana, Florida, and Rhode Island. These involve empowering the poor with ownership via their own special accounts or insurance policies that have incentives to choose services wisely. Perhaps the single best idea I’ve seen comes as a bill that has been introduced in the New Jersey Senate that uniquely looks at a partnership between state government and private charity. Senate No. 2231, also known as the “Volunteer Medical Professional Health Care Act”, is a brilliant idea that should cross party and partisan lines with appeal to anyone who seriously wants to provide better access at lower cost along with less government involvement and control. Very simply, New Jersey Senate No. 2231 would grant any physician (primary care or specialist) or any dentist who agrees to volunteer at least 4 hrs per week in a non-government free clinic, immunity from civil liability through the entirety of their medical or dental practice in the state. These physicians would not need to purchase malpractice insurance and be freed from oppressive Medicaid regulations and scrutiny, creating an almost irresistible incentive for many more physicians to participate than are willing to commit to Medicaid. Medicaid would never be involved or ever billed for any of this service. The New Jersey chapter of the Association of American Physicians and Surgeons (AAPS), who inspired the legislation has estimated New Jersey could expect to save $2 billion of a $10.2 billion Medicaid budget or close to 20%, while offering more timely and much better care for those they see. AAPS itself was inspired by the vision of two members, Drs. Alieta and John Eck, who responded to the needs of the poor and their concerns over the pitfalls of Medicaid by starting a free clinic in their hometown, Zarephath, NJ, in September of 2003, thus will enjoy their 10th anniversary this year. Governor Corbett in Pennsylvania and other Governors who courageously declined to expand Medicaid made the right choice and need to stick to it. Opponents need to open their eyes to existing realities, and all need to come together to find better solutions such as S-2231 in New Jersey as well as others. AAPS has informed me that similar legislation may soon be introduced in UT and AZ. It is not enough to decline Medicaid expansion and then do nothing, while being falsely painted as uncaring by those with insufficient understanding.